What is a compressor pressure switch and what does it do for us air compressor users? There are many questions about the operation of a compressor pressure switch on the pages of this site. As a result, there are a number of pages about compressor pressure switches, their problems, and the remedies. This page is about identifying, the operation of the pressure switch, and some basic troubleshooting techniques. See the other pages, linked from the site map page, for specific solutions to specific problems. A pressure switch is simply a device that reacts to the changing pressure in a system and either opens or closes a circuit to cause an action in response to the changing pressure in the system. In the case of our air compressor, the action is to turn on or turn off the electric motor of the air compressor. The photo above depicts one view of an air compressor pressure switch on a DIY type of air compressor. Smaller air compressors may not have a visible pressure switch, and the pressure switch on your compressor may be visible, but be of a different shape, color etc. The black box above contains the working components of the pressure switch, including the method of adjusting the cut in and cut out pressure levels of your air compressor. The handle at the bottom front of the pressure switch with the red knob on the end is the OFF / RUN switch on this unit. Your compressor switch may vary, or you may not have a handle at all. On the right in the photo you can see just the top of the tank air gauge on my compressor (with the white label on top ). This gauge shows the pressure in the tank and also shows the cut out pressure level reached when the pressure switch shuts off the compressor, and the cut in pressure level when the switch starts the air compressor. If you wish to explore your compressor pressure switch, and I do recommend that you make yourself familiar with what is inside, make sure first that the compressor power supply is unplugged then go ahead, remove the cover. You want to be sure the power is off as there are live power connections inside the lid. 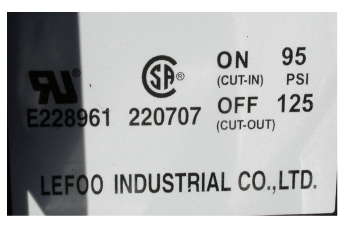 The label under the lid on my pressure switch shows the electrical certifications, the manufacturer of this switch, and also some very important information for me if I have to replace the switch, and that is the cut in and cut out pressure levels for this switch. Not shown on my photo, but also on a label under the cover, is an electrical schematic of the switch which you can refer to in the event you have pulled all the wires without marking them for re-wiring of the new switch. I expect that your switch will likely have this information under the lid too. This next photo shows the wiring of my compressor pressure switch, and also the sealant-smeared adjustment nuts. There are two nuts buried in sealant, one on each side, and one of them is to adjust the high pressure cut out, and the other the low pressure cut in. You will not normally need to try to adjust the pressure settings of your pressure switch. The settings are properly set at the factory for the correct operation of your air compressor, and there is little to be gained by messing with them. Unless, of course, you buy a replacement pressure switch for a burned out one, and have to set the proper cut in and cut out levels for your compressor. You can see that the sealant on the adjustment nuts on my compressor is pristine, and it will stay that way. If I have a pressure switch problem, then I will simply replace the switch. The cut out and cut in pressures levels of this air compressor are satisfactory for my needs, else, I would have purchased a compressor with higher or lower pressures. Again, you do want to know what your present compressor pressure switch settings are. In the event you replace your pressure switch with an after-market unit, you may have to reset that new one to match the original settings. On many air compressors the unloader valve is typically located on the side of the pressure switch and it is activated by by the cycling of pressure switch points as they open to stop power flow to the motor circuit, and close to resume power to the motor. Other pressure switches have an internal unloader that is connected to the tube from the tank check valve by a fitting on the underside of the switch. In the photo you can see the brass colored unloader valve on the side of the pressure switch. This type of unloader valve is toggled by a lever that is protruding from the side of the switch. That lever moves up and down as the pressure switch trips on and off, and in so doing, operates the unloader valve actuator by depressing or releasing the pin, which can be seen protruding down from the bottom of the valve. This page provides detailed information about the compressor Unloader Valve. If you are not sure if your pressure switch is working, first thing to do is unplug the compressor, pull the cover, and then bleed all the air out of the compressor tank. If the pressure in the tank is higher than the cut in pressure of the switch, the switch will not trip. As the pressure drops it will reach and lower past the cut in pressure of that switch, and you should be able to see and hear the switch trip. If the pressure in the tank is below the normal cut in, then plug the compressor in, and use a multi-meter to check and see if voltage is flowing through the switch to the motor. If there is no pressure in the tank, the switch should have tripped to ON, and power should be flowing. If it is not, then perhaps the pressure switch is pooched. There are a couple of issues with pressure switches that are common problems regardless of the brand of compressor they are installed on. 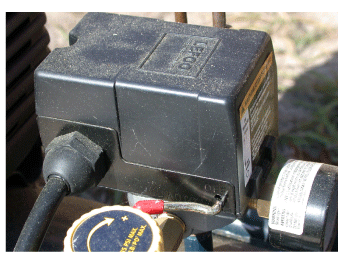 One of those problems is often confused as a pressure switch or unloader valve leak. In the event your pressure switch or unloader valve is bleeding air constantly, the problem may not be either. The compressor check valve may be the issue. 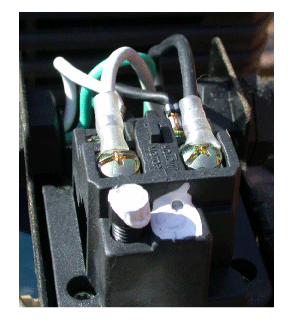 Read about leaking unloader valves on the pressure switch and how to fix them on this site. If you are still having trouble with your compressor pressure switch, there is a pressure switch troubleshooting page that has lots of postings from folks that have a compressor switch problem, a lot of advice you can read and comment on, and a place for you to post your own question if the answers there do not suffice. If you diagnose your compressor pressure switch as having failed, see the page on this site about selecting a new one. Have a question about a compressor pressure switch? Post it below and add photos please.